Sixteen out of the 20 African countries whom have had detailed surveys of living conditions since 2005 reported decreases in their child-mortality rates (this rate is the number of deaths of children under five per 1,000 live births). Twelve had falls of over 4.4% a year, which is the rate of decline that is needed to meet the millennium development goal (MDG) of cutting by two-thirds the child-mortality rate between 1990 and 2015 (see chart). Three countries—Senegal, Rwanda and Kenya—have seen falls of more than 8% a year, almost twice the MDG rate and enough to halve child mortality in about a decade. These three now have the same level of child mortality as India, one of the most successful economies in the world during the past decade. The decline in African child mortality is speeding up. In most countries it is now falling about twice as fast as during the early 2000s and 1990s. More striking, the average fall is faster than it was in China in the early 1980s, when child mortality was declining around 3% a year, admittedly from a lower base. of decline in African child mortality are the fastest seen in the world for at least 30 years. One important observation is the fact that the falls have happened in countries large and small, Muslim and Christian, and in every corner of the continent. The three biggest successes are in east, west and central Africa. The success stories come from Africa’s two most populous countries, Nigeria and Ethiopia, and from tiddlers such as Benin (population: 9 millions). You might expect that countries that reduced their birth rates the most would also have cut child mortality comparably. This is because such countries have moved furthest along the demographic transition from poor, high-fertility status to richer, low-fertility status. But it turns out that is only partly true. Senegal, Ethiopia and Ghana all have majorly reduced fertility and child mortality. 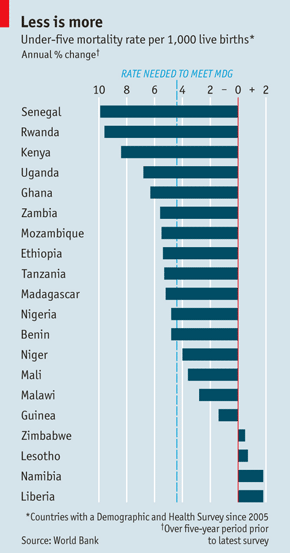 But Kenya and Uganda also did well on child deaths, though their fertility declines have stalled recently. So it cannot all be just about lower birth rates. Liberia, where fertility remains high, did poorly on child mortality—but so did low-fertility places such as Namibia and Lesotho. The link between mortality and broader demographic change seems weak. What makes a bigger difference? It is some combination of broad economic growth and specific public-health policies, notably the increase in the use of insecticide-treated bed nets (ITNs) which discourage mosquitoes, which cause malaria. Ethiopia, Ghana, Rwanda and Uganda have been among Africa’s star economic performers recently, with annual GDP growth averaging over 6.5% in 2005-10. At the other end of the scale, Zimbabwe saw its GDP fall and mortality rise. This seems intuitively right. An increase in national income should reduce mortality not just because it is usually associated with lower poverty and better nutrition but also because growth can be a proxy for other good things: more sensible economic policies; more democratic, accountable governments; and a greater commitment to improving people’s living standards. But growth offers no guarantees. Liberia, with high-mortality rates, actually saw an impressive GDP increases whereas Senegal, whose record in child mortality is second to none, had a rather anemic growth rate by recent African standards (3.8% a year, half that of Rwanda). “The miracle of low mortality” has taken place in different circumstances suggests there can be no single cause. To look for other explanations, therefore, we can look at Kenya in more detail*. Kenya is a test case. It has cut the rate of infant mortality (deaths of children under one year old) by more than any other country. It has had healthy economic growth (4.8% a year in 2005-10) and a functioning democracy, albeit after horrendous post-election violence in 2008. Moreover, it increased the use of treated bed nets from 8% of all households in 2003 to 60% in 2008. As a result, half the overall drop in Kenya’s infant mortality can be explained by the huge rise in the use of ITNs in areas where malaria is endemic. Bed nets are often taken as classic examples of the benefits of aid, since in the past they were pioneered by foreign charities. Consistent with the view that aid is vital, Jeffrey Sachs, an American economist, recently claimed that a big drop in child mortality in his Millennium Villages project (a group of African villages that his Earth Institute of Columbia University, New York, is helping) is the result of large increases in aid to villagers. In fact, argues Mr Demombynes, a World Bank representative, the mortality decline in these villages was no better than in the countries as a whole. Sustainable development will not be achieved unless hunger and malnutrition are eradicated, stated by the United Nations food agency in a recent report. One of the great flaws in current food systems is that despite significant progress in development and food production hundreds of millions of people are hungry because they lack the means to produce or purchase the food they need for a healthy and productive life. “We cannot call development sustainable while this situation persists, while nearly one out of every seven men, women and children are left behind, victims of undernourishment,” said the Director-General of the Food and Agriculture Organization (FAO), José Graziano da Silva, in a news release. In the report – entitled Towards the future we want: end hunger and make the transition to sustainable agricultural and food systems – was prepared for the UN Sustainable Development Conference (Rio+20), which will be held in Brazil next month. The FAO stresses the need to address the flaws in the current food system so that hundreds of millions of people in developing countries have the means to produce or purchase the food they need for their own consumption and income. To establish and protect rights to resources, incorporate incentives for sustainable consumption and production into food systems, promote fair and well-functioning agricultural and food markets, and invest public resources in public goods, especially innovation and infrastructure, among other measures. To help farmers who operate 500 million small farms in developing countries and whose resources are limited due to insufficient access to food and nutrition. The need to change consumption patterns in the developed world to reduce food waste. FAO estimates that global food losses and waste amount to 1.3 billion tons per year, which represents roughly one-third of the world food production for human consumption. To be able to feed the expected global population of nine billion people in 2050, an improved governance of the food and agricultural system is required. “Unless purposeful action is taken, the increase in food production of 60 per cent needed to meet effective demand will still leave over 300 million people behind who are expected to suffer from chronic hunger in 2050 because they will remain without the means to access food,” FAO noted. As a much needed holiday gift, U.N. policy makers recognized October 11th as a day to realize the difference girls make in their families, communities, and countries. Accord to Nigel Chapmen, CEO of Plan International, girls are at a huge disadvantage simply because of their gender. The creation of a day that recognizes the importance of respecting, educating, and empowering girls will help put a focus on girls’ rights to equality. We at CKi look forward to celebrating this day to recognize and benefit the most vulnerable citizens of the world: girls.